Photo above: Left to right: Joe Centamore, Kathie Acker, Jaime Rogers, Dave Bennardo, Jim Kaden, and NYS Assemblyman Chad Lupinacci. 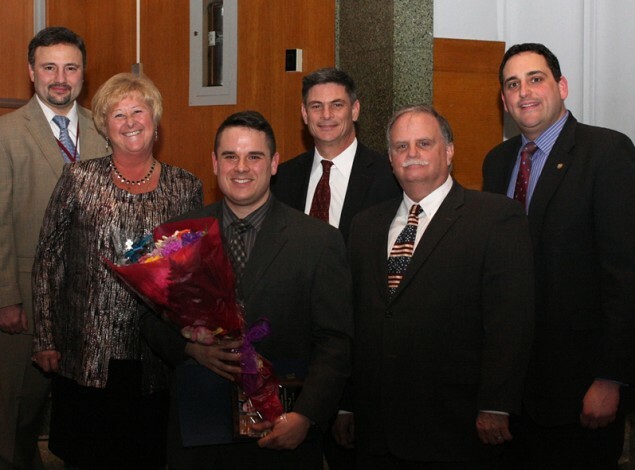 The South Huntington Board of Education, the district’s administrators, and the South Huntington learning community were out in full force on February 12th, to give well-deserved recognition and praise to their top teachers during this annual celebration. “The teachers being honored have demonstrated a belief in our children; have inspired them to achieve new heights and have influenced all those whose paths they have crossed,” said Dr. Joseph T. Centamore, Assistant Superintendent for Personnel and District Services. “Mr. Rogers has the ability to reach all students. He truly looks at each student individually and has the ability to foster confidence in them using strengths that he has identified. He creates an environment where students feel safe to be themselves in front of others while learning the importance of accepting others for who they are,” continued Principal Acker. Congratulations to all these fine teachers, who make a difference and truly love what they do.